Surely there must be a way of playing your original NES cartridges on the go! When the Game Boy first came out, rumors were spread that Nintendo was working on a color Game Boy, and that it would even run NES carts! These rumors, we know now, were not to be. We were allowed to dream though, weren't we? And it turns out that while we were just dreaming of such machines, companies in the Far East were busy making those dreams come true! Throughout Asia, cartridges for the Nintendo Famicom (the name of the NES in Japan) were everywhere - both genuine and pirated. Various companies had for years been turning out machines to play these carts on, known somewhat affectionately as "Famiclones." Many of these systems were based upon a chip that's come to be known as NOAC, the mysterious "NES on a chip", a reverse-engineered hack that squeezes all the chips in the 8-bit Nintendo consoles down into a single little chip. It's not a perfect copy by any means. The colors it produces aren't always correct, some titles don't work or freak out, and the sound is glitchy or sometimes just sounds slightly wrong. The chip did, however, have low power requirements, which led to it being ideal for cramming inside a case, then sticking a screen and speaker on it. Behold the (ahem, unlicensed) portable Famicom! They weren't necessarily the first to come up with the idea but for a long time the Game Axe from Redant was the best attempt at making such a machine we had seen so far. 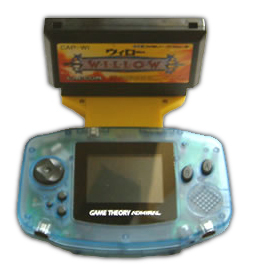 It was far from being pocket-sized, and more along the lines of the Sega Nomad in girth. It did however have a full color screen and a decent sounding speaker. It also shared the immense hunger for batteries (6 AA batteries!) of the other color handhelds of the time. The machine is also designed to be used with the smaller cartridges of the Famicom, so NES carts need an awkward adapter and thus have a tendency to protrude from the unit by quite a bit. You can also plug the machine into your TV, which kinda defeats the entire point of the thing being handheld. Availability-wise, these things are pretty damn rare. They were sold through websites like Lik-Sang, and only occasionally surface on auction sites. There were two different models, one with a 3" screen, one a 4" screen. Thousands were made, making locating one difficult, but not as impossible as you might think. Even rarer than the Game Axe is the superbly named Top Guy. It comes from the "How can anybody think this design looks nice?" school of design, having a typically bad counterfeit electronics look and feel to it. The general consensus though, is that the Top Guy is the first Portable Famiclone machine to have burst into existence. They were only made in extremely limited numbers though, estimated at around 1000 units. They have become ludicrously sought after among collectors and the chances of you seeing one up for sale are practically nil. The next system to come along was the Game Theory Admiral by Mystery. Now that's a name no doubt picked by taking the word "Game" and selecting the other two words by opening a dictionary at random. It is however a very compact system, being a little narrower but a little taller than an original Game Boy Advance unit. 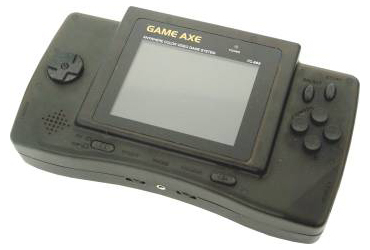 It takes half as many batteries as the Game Axe, has a superior quality screen and gives much better battery life. There are some setbacks, though, due to its size. The screen is noticeably smaller than the one on the Game Axe and the minute cartridge slot doesn't actually accept either Famicom or NES carts. A funky yellow adaptor is supplied to enable play of Famicom games, and NES games. Yes, you need to stick another adaptor into the mix. These machines have a tendency to be wobbly enough with just the NES to Famicom adaptor attached. So the Game Theory Admiral turns into a crazy balancing contest! 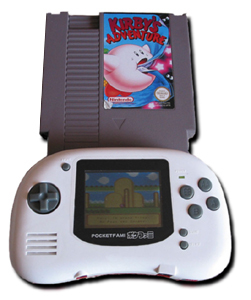 The last of the clones is the Pocket Fami from GameTech. It's the most modern and best-looking unit of the bunch, almost looking how we would expect such a machine to look like had it been produced by Nintendo themselves. The story of how it came to be has an interesting background. Its maker, GameTech, launched a clone of the Famicom console, the NeoFami. 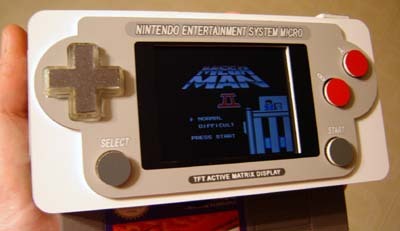 When the men from Nintendo came knocking with orders to stop manufacture, GameTech laughed, "See you in court, suckas," challenging that after 20 years since the release of the original machine, the patents had expired and now anyone could make a copy. The courts ruled in GameTech's favor, legitimising the whole NES clone market, and leading to the development of the Pocket Fami. The Pocket Fami is definitely the most compact way of getting your genuine 8-bit action on the move. Like the Game Theory Admiral it has a smaller sized screen but it accepts the Famicom cartridges without need of an adapter, hurrah! It also only takes 3 AA batteries. If you are going to pick one up, it's not too difficult to grab a selection of original Famicom cartridges these days, the Internet being as wonderful as it is! You can still run your NES cartridges on the Pocket Fami using the same adaptors as the other units. 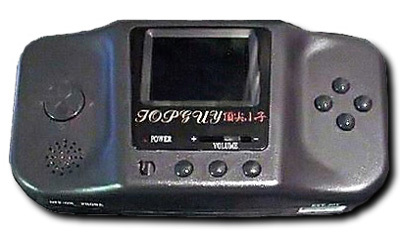 The machine had an "official" western release in 2005 from a company called Fire International, who rechristened it the BLAZE Pocket Fami. It came packaged with an NES adapter and sold very well for the time it was on sale, making it out of all the machines here, the easiest to get ahold of currently. What if none of these machines are up the high standards you've set for yourself. What is there to do? It's entirely possible to go ahead and make one yourself! One very clever guy by the name of Benjamin J. Heckendorn has spent the last few years shrinking down all kinds of home consoles into portable units. One of his most recent creations being an NES Micro, inspired by the Game Boy Micro but totally dwarfed by the size of the NES cartridge itself.